Barcelona's players woke up to a downpour yesterday morning, proving that the rain in Spain does not fall only on the plain. The night before, the European champions sent out a message that, despite taking qualification for the next phase to the wire, they are alive and well in the Champions League. Barcelona, moreover, may be about to prosper. Samuel Eto'o and Lionel Messi are yet to return from injury, while Ronaldinho is in such form that Eidur Gudjohnsen left the Nou Camp saying: "One of these days he will make the ball talk." Even by Ronaldinho's standards his was an exceptional performance, capped by a goal that had his colleagues talking animatedly about an hour after the final whistle. Seeing that Werder Bremen's players were going to jump in the wall at a free-kick, Ronaldinho struck the ball under them and Barcelona had their breakthrough in the 13th minute. "It is fantastic how clever the guy is," Gudjohnsen said of Ronaldinho. "He seems ready for every situation and the bigger the game, the more he can handle it. He saw that they were going to jump. What he said in the dressing room afterwards was the two really big guys in the wall wouldn't jump so he put it under the smaller ones. He's a great player and I guess that makes him psychic. When you play with him and see what he does with a ball, nothing surprises me any more. One of these days, he will make the ball talk." Giovanni van Bronckhorst was equally enthusiastic about the Brazilian: "He knew exactly what he was doing. It was all pre-meditated although I have never seen him try it before, in training or matches. He thought what the wall would do and he pulled it off. It's amazing, but that's what you get from the best player in the world." Stabilised by their victory over Werder, or 'tranquil' as manager Frank Rijkaard put it, Barcelona can now relax and consider the next step in the defence of their title. Gudjohnsen, however, was not about to call his new club favourites, especially as he knows how that remark would go down at his old club. "I am sure that Chelsea anticipated us going through," Gudjohnsen said. "I don't know who are favourites at this point. We are just glad to get through and we will worry about that when we see the draw." "Before the game, the manager just said to enjoy it. What happens, happens but he said to imagine the people who dream of playing in front of 100,000 fans and to experience a fantastic night like this. For me, playing for Barcelona has been everything I dreamed of and more. You can understand why every footballer in the world dreams of playing for Barcelona. Everything about the club, the stadium, the fans, the build-up - and the best player in the world." One subject that went unsaid was the occasional defensive lapse and whoever draws Barcelona in the last 16 will hold onto the hope that if Diego and Miroslav Klose can work openings in the Nou Camp, so can they. They may have scraped through their group, but it won't be easy to take the Champions League trophy away from Barcelona. On the brink of making unwanted history as the first holders of the Champions League not to emerge unscathed from the group stages, the challenge Barcelona faced this evening should not be underestimated. Up against them were the free-scoring Bundesliga leaders, who were so unlucky to be eliminated by Juventus last season, were denied victory by a last-minute Barça goal earlier in this campaign, and showed in the second half tonight - albeit when it was too late - why they'll now be difficult to beat in the Uefa Cup. Yet in the first half Barça made the team in green and white look more like Yeovil than Werder Bremen, and in the process installed themselves as Champions League favourites once more. What makes this achievement even more impressive is that Barça were missing two of their first-choice forwards, Lionel Messi and Samuel Eto'o. Consider that loss of penetration and firepower for a second. How would Manchester United cope without Cristiano Ronaldo and Louis Saha? Or Chelsea without Andriy Shevchenko and Didier Drogba? Or Werder without Diego and Miroslav Klose, for that matter? But Barça have world-class replacements for this pair in Ludovic Giuly and Eidur Gudjohnsen. In England, Gudjohnsen was known as an inside-forward, a guy who could either play off the striker or as a central midfielder. But at the Nou Camp, in Eto'o's absence, Frank Rijkaard has made him the pinnacle of the attack, as he is for Iceland, and with nine goals already this season he's proven his versatility. Giuly, meanwhile, was excellent, providing constant width as an outlet for Ronaldinho's left-to-right passes all night. It was just a shame he somehow missed from six yards after Gudjohnsen had almost scored the goal of the tournament with his jinking run through four defenders. Barça's start to this game was similar to the relentlessness that the Australian cricket team showed against England in the early hours of this morning. Like the Aussies, Barça exerted such a stranglehold on the opposition that their thoughts were fully occupied with defending, rather than on how they could attack. Werder's mindset, usually so positive, became like England's: how to save the game, rather than how to impose themselves on it. It's partly because of their brilliance going forward that Barça are so miserly at the back - they've conceded less than a goal a game in La Liga this season - and so, where England scored just 28 runs in the morning session, Werder didn't manage their first shot until the 37th minute tonight. And Naldo's strike was off target. Of course, just as the catalyst for Australia's success was Shane Warne, it was Barça's go-to man, Ronaldinho, who set them on their way with a moment of pure genius. For those who think his free-kick - which was impudently slid under the wall as the Bremen blockade jumped en masse - was a fluke, think back to how the same player embarrassed David Seaman in the 2002 World Cup quarter-finals with an equally unusual set-piece. Barça fans will have recognised tonight's trick - Rivaldo used to perform it frequently during his spell at the club. And yet as happy as the Catalans will feel when they awaken to triumphant headlines, they're a long way from repeating tonight's celebrations in Athens in May. The very nature of the knockout stages dictates this, with little to choose between the top dozen or so teams. Last year there was such a paucity of goals - 19 in 13 games from the quarter-finals onwards - that any side could beat any other in a two-legged tie. For now though, Barça are happy just to have such concerns. The only history they can now make is as the first holders to retain the Champions League crown, rather than as the first holders to lose it at the first hurdle. And the tournament itself is the richer for that. "To Be Or Not To Be, That is the question"
The famous dialogue from 'Hamlet' might be the best way to describe Barcelona's situation in the Champions league. For all their artistry and talent of this great bunch of entertainers this will be their moment of truth. Bremen might not be an easy task but Barca have no other choice. Defending champions Barcelona take on Werder Bremen for a place in the Champions League last 16 tonight. The knock-out phase of the Champions League is meant to start in mid-February but at Camp Nou this evening the European Cup holders Barcelona have to win just to make it into the hat next week. Werder Bremen have arrived in Catalonia two points ahead of Barça in Group A and a draw will see the German side through alongside Chelsea. For Barcelona that scenario is unthinkable, but it is all many can think of. "We don't want to think about that," was Frank Rijkaard response to the proposition yesterday afternoon. "We are preparing to win the game. It doesn't help to think about losing, it doesn't cross our minds. We have to go out there and do our jobs and beat Bremen, who are a very strong team. We are only thinking about completing our job and we don't want to think negatively. We've had a lot of success, they are a good team. It will be an interesting game." Rijkaard's choice of adjective was interesting in itself. The agenda can change with a home win, of course, but at this juncture, seven months on from overcoming 10-man Arsenal in Paris, the thought of Barcelona being the first club to retain the European Cup since Milan in 1990 against Benfica is not dominating the Catalan mind. A different statistic is rather more conspicuous: that if Barça do not win they will become the first reigning champions not to make it past the group stage since the advent of the Champions League group system in season 1992-93. In such circumstances qualification for the last 32 of the Uefa Cup could not be considered an achievement. A repeat of last season's meeting at Camp Nou, when Werder were beaten 3-1 - adding to a 2-0 Barcelona triumph in Bremen - would make the current bout of tension look unjustified. Ronaldinho scored in both of those matches and, having been rested for the 1-1 away draw with Levante at the weekend, returns to spearhead an attack that will be missing not only Samuel Eto'o but also Lionel Messi. Messi scored an 89th-minute equaliser in Bremen in September, otherwise Barça would already be eliminated, but is now another long-term injury. "I'm going to play the same way I always do," said Ronaldinho yesterday, "putting more pressure on my shoulders won't help my game. Only a win will do, so the responsibility is squarely on us." In what Werder may call mind games, Rijkaard spoke of an "added motivation - that Bremen have said they are better than last year. They have pressured themselves." Bremen are leaders of the Bundesliga, and observers have noted the height advantage the German team will have again and they know all about the pressure of close encounters. Last season they were two minutes away from dismissing Juventus to reach the last eight when their keeper, Tim Wiese, spilled a straightforward shot that Emerson then tapped into the empty net. That made it 4-4 on aggregate and it was Juve, on away goals, who went on to meet Arsenal. Wiese remains in the Werder goal and the 24-year-old partly redeemed his reputation in the 1-0 win over Chelsea that has teed up this evening's intriguing meeting. Routinely described as "self-assured", Wiese said: "I'm certain we'll win 1-0 and reach the last 16. Of course the pundits and fans have labelled us outsiders, but we see ourselves on a par with Barça and believe we have a good chance." It will be of no consolation to the participating teams but whoever fails to progress, at least the Uefa Cup will be enhanced. It has to be the worst performance by this talented Barcelona side to date. Even in the pre Ronaldinho season, I cannot see a match being played like this. It seems none of the players realized that Football is played for winning. The usual excuse has to be "they might not had Ronaldinho in the match neither they had Messi, Eto or saviola", but then this is not Chelsea or Real Madrid you are playing. The worse thing from yesterday's match is the attitude shown by players. I always believed that the match against Levante shud have been a trailer for the fans ahead of Bremen clash. But seeing their performance its plain clear that 99% chance are there to see this side go out of Champions League. Pheeeewwwwwwwwww.... What a match..... First half looked like we were watching the best match in the season after the interval Barca just blewed Villareal away. Villareal might have been without their masterclass midfielder Riquelme, but they made Barca sweat very prolifically in first half. The second half was a clear contrast to its former. And its sad to see the real hero of the match(Deco) being sink in the Ronaldinho overhead kick. Deco seems to understand his responsibility very well. He is doing what Ronnie did last season without much fans and media glare. Iniesta will be the key in match agnst Bremen. Real Madrid in Valencia. Two faces, two identities, two approaches, one result. Twelve weeks into the season and the Big Two(TM) are just three points apart. Three points and a world. where the ball was," admitted goalkeeper Mariano Barbosa. "Still, at least I'm in the photo, eh?" But rather than head it, Ronaldinho controls the ball on his chest, turns his back to goal, leaps into the air and hits a Chilean, as they say in Spain. Not punching Pinochet - although God knows he'd deserve it - but overhead kicking it past Barbosa. "It was a historic goal," beamed president Joan Laporta. "Priceless! It was like a computer game," screamed Marca, conjuring up deeply unpleasant images of big-bellied geeks with perspiration pouring through their pants, "somewhere a programmer starts to sweat; he has to turn this into a video game." AS, meanwhile, lauded it as the act of "a genius who is impossible not to love," and a million commentators shouted gol a billion times. As for the Camp Nou fans, they went bonkers and so did Dinho. Out came the hankies, off came the shirt and out, inevitably, came the yellow card - an act of pointless pettiness to sully a brilliant goal. And yet referee Pérez Lasa's jobsworth behaviour as Dinho ran round the pitch doing a Giggs was not the only cloud, nor the weekend's worst, most mean-spirited moment. Hell, even the ref who broke the world record by showing five red cards in 12 minutes, culminating with the sending off of Almería goalkeeper Sander Westerveld, was not the worst. Because worse still was Real Madrid in Valencia on Sunday night. If Barcelona reminded why you fell in love with football, 24 little hours later Madrid showed you why you could be forgiven for shacking up with someone else instead. minutes, it was pretty awful. "Real Madrid played on the counter-attack,"
us all of half the game. 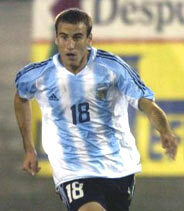 Cristian Ceballos is a chaval of 12 years that was the last year to play the Barsa. It played in the Bansander and when the Racing wanted it to play the Channel Extra and to file it wine the Barsa and took it to the Masía. To him and his family, with a work to be near the chaval. I can assure to you that I have not seen anything similar to that age and sight that I have seen many. Not even Jonatan. So that you hagais an idea, Ronaldinho was summoned to give a practical exercise with 11 or 12 chavales of the inferior categories of the Barsa and appear he there seeing as it throws Ronaldinho lack. This podeis to find in the Google if deletreais Cristian Ceballos.Creo that is a page of the Sport World. This year has played little because average injured season is had past. It is difficult to guess if soccer will arrive very high (his worse enemy is his short stature and weight) but must to give and to give. Hopefully it prevails mainly by the good of soccer and because his first steps gave them here. LUCK CRISTIAN! Its not only the struggle by the giant to stay in the league, its also the struggle by a minnow to make their mark. Its for this precise reason Frank Rijkaard has to be worried of the challenge he is facing at Levski. Failure is not an option for him with such a talented side. So Barca has to overcome the stiff chilly climate, a hostile crowd, a one hour shift and a determined Levski Sofia team to keep their Champions League hopes alive. There are many positive signs for them with Ronnie slowly finding his touch, Deco becoming a silent executor and Iniesta doing well inthe middle. But all their problems in this season has came when they travel away from Nou Camp. So the team has to show determination shown like the 2nd leg match against Chelsea. forwards - Messi, Saviola and Eto'o - the only ones missing. Telkiysky and the versatile Yoyov for support, as Levski have a go at Barcelona. Squad: Valdés, Jorquera, Iniesta, Ronaldinho, Edmílson, Puyol, Sylvinho, Gudjohnsen, Márquez, Ezquerro, Giuly, Oleguer, Xavi, Thuram, Motta, Zambrotta, Gio and Deco. Probable Starting XI: Valdes - Zambrotta, Puyol, Marquez, Gio - Iniesta, Edmilson, Deco - Giuly, Gudjohnsen, Ronaldinho. impression on the Barcelona defense. Barcelona's striker shortage could see them take a gamble on much-vaunted youngster Bojan Krkic. After the 16-year-old predictably sparkled on his Barca B debut at the weekend, against Huesca, Frank Rijkaard must be tempted to consider promoting the precocious teenager into his first-team squad next year. Krkic has been touted as one of the best young players in Europe and is reputed to have bagged over 800 goals at junior levels for the Catalan giants. Although he did not score on his senior bow, the Spain youth international's progress will be closely monitored as Rijkaard currently seeks replacements for the likes of injured trio Samuel Eto'o, Lionel Messi and Javier Saviola. His father is a former Crvena Zvezda player from Serbia but Krkic has opted to represent Spain. There were rumours a short time ago that the forward snubbed interest from Chelsea to commit his future to Camp Nou. Barcelona exploded into life after a slow start, and ran out convincing winnners against a Mallorca side who put up more than a fight. Rijkaard started with Oleguer ahead of Zambrotta on the right, and Motta and Iniesta ahead of Edmilson and Xavi, clearly with one eye on the midweek clash against Levski Sofia. Manzano also dished out a surprise, going with just Maxi Lopez up front, packing five across midfield with Arango in a roaming role. It worked, for it was the hosts who settled well into the game, denying Barcelona time or space. However, they lacked bite in the final third, and could not find the goal to show for all their efforts, even as Basinas came close with a long range drive, and Arango headed just over from a corner. Barcelona were struggling to settle in, and half an hour into the game, there were still no shots on target for either side. Just as it was beginning to look like Barcelona were not up for this one, came the kind of move that few teams other than them can put together. Ronaldinho received a ball from Motta on the edge of the box, superbly turned his marker, slid it wide to Deco, who slipped it superbly to Gudjohnsen, and the Iceland international calmly touched it around the Prats, and slotted it into the empty net to break Mallorca's spirit on the stroke of half time. Manzano's half-time talk must have been inspirational, for Mallorca refused to throw in the towel after the break. Maxi Lopez had a fabulous chance ten minutes into the half, but failed to keep his composure, allowing Valdes to save easily. They were made to pay minutes later, as a peach of a pass from Iniesta found Gudjohnsen, who touched and turned in one swift move, and calmly slotted it past Prats to make it 2-0 in the 58th minute. Victor Casadesus came on for a clearly frustrated Maxi Lopez, and Jordi for a tiring Basinas, as Manzano looked towards fresh legs. Rijkaard's mind was already on Wednesday's trip to Levski Sofia, and he brought Zambrotta on for Puyol, with Oleguer slotting into the centre alongside Marquez. The Mexican took it a little too easy, though, as Victor managed to win the ball from him in the Barcelona penalty area, and coolly slide it through the legs of Valdes to bring Mallorca back into the game with 20 minutes left on the clock. That woke Barcelona up, though. Ezquerro came on for Gudjohnsen, who had done his job for the night. Mallorca tried to get the equalizer, but failed, even as Diego Tristan was thrown into the mix. Barcelona were beginning to find spaces, and look really menacing on the break as Mallorca threw the kitchen sink at them. With ten minutes left on the clock, a pass from Gio sent Deco free up the left, but he was brought down by Varela, who picked up his second yellow of the game for his efforts. That was the end of Mallorca's challenge, and time for Barcelona to rub it in. Rijkaard took the opportunity to bring Xavi on for Giuly. Iniesta move to the right, with the freedom to go forward, and made it 3-1 with five minutes left on the clock after some superb work from Ronaldinho, and Ezquerro grabbed one for himself in injury time to make it a dominating 4-1 win. Barcelona go back to the top of the table, one point ahead of Sevilla, and three ahead of Real Madrid. Mallorca: Prats - Pereyra, Ballesteros, Nunes, Navarro - Jankovic, Ibagaza (Tristan, 80'), Basinas (Jordi, 61'), Varela - Arango - Maxi Lopez (Victor Casadesus, 61'). Barcelona: Valdes - Oleguer, Marquez, Puyol (Zambrotta, 63'), Gio - Iniesta, Motta, Deco - Giuly (Xavi, 82'), Gidjohnsen (Ezquerro, 71'), Ronaldinho. Rumours around Camp Nou suggest that president Joan Laporta and his technical staff are trying to bring the transfer of Boca star Rodrigo Palacio, originally scheduled for summer 2007, forward to the January transfer window. Due to the long term injuries to Barca´s attacking line (Eto’o, Messi, and Saviola out for several month) the president and his technical crew are keen to bring the planned transfers of Palacio forward to January. currently for Argentine first division club Boca Juniors. first ever appearance in a World Cup. Originally Barca´s intention was to negotiate the transfer of Rodrigo Palacio next summer after Boca held out to an inflated asking price of € 15 mill. Due to the injury miseries, it seems that Barca is willing to speed up the transfer and give in to the high transfer fee.Boca´s Rodrigo Palacio is one of the targets added to Barca´s short list which includes former Barca striker Henrik Larsson and Newcastle´s Albert Luque. Barcelona Injuries to Eto'o, Messi and Saviola have left Barcelona's season in the balance. It will take something special from the rest to limit the damage before they can recover, or reinforce. Rewind to August, and the talk of Barcelona was whether Saviola would be surplus to the club's needs - a luxury. The Catalans were desperate to offload the Argentine, to the point that they even offered him a letter of freedom. Barely three months later, injuries to Messi and Eto'o have left their attack crippled. Just as it started to look like Saviola would turn saviour, even he was sidelined. There have been injuries previously too - Larsson, Motta, Edmilson two years ago, Xavi, and Messi last year - but it was spread over the pitch, allowing them to recover. Its three forwards this time, and with a wafer-thin forward line remaining, it looks very slippery. Nobody was willing to consider reinforcements when Eto'o was injured - maybe rightly so, maybe not. They were still just as dismissive when Messi was ruled out. But within hours of that, Saviola's muscle problems came to the fore, and the tone started to change. From a 'we don't know', it turned into a 'maybe', and now, Luque, Larsson and Palacio are firmly placed on the Catalans' radar. Yet there is little they can do until January, as an emergency signing requires a five-month injury layoff. Barcelona's only chance was when Eto'o was injured, but they had no way of knowing that it could go so wrong. That said, they were guilty of underestimating the Cameroon international's importance. You have to ask yourself if Chelsea would have signed a Drogba replacement, or if Real would have covered a hypothetical Ruud absence. The answer, unfortunately, puts Barca on the wrong side of the fence. The Catalans now have four players - Ronaldinho, Gudjohnsen, Giuly, Ezquerro - for three positions, and must make do with that at least until January. They still lead La Liga, but it's so close at the top that a couple of bad weeks could see them drop outside the top four. The problem, however, lies elsewhere. They must win both their remaining Champions League games to qualify for the knock-out stages, and it is not clear that they have an edge over a very dangerous Werder Bremen with the attack that remains. It is surprising that even now - at a time when the club need to put their hands up and say: 'yes, we need to reinforce,' with no strings attached - sporting director Txiki Begiristain indignantly argues that Iniesta and Deco can also play in more advanced positions, conveniently forgetting that it is bite up front that is the real problem. One understands that success has made them confident, and that has its positives, but there is a fine line between that and arrogance. Txiki continues to insist that Giovanni Dos Santos - arguably a natural replacement for Messi - should not be called up from the junior team, as it is more important he remains available for Barca B. One more injury or suspension could leave them with absolutely no options on the bench, making two games a week almost impossible to cope with. Even if they are lucky hereon, the impact on the players still available will be felt come April, when thin squads start to burn out. Ronaldinho and Giuly look set to play two games a week for the next two months, and one has to wonder whether Barca can even afford to compete in four remaining competitions - including the Intercontinental Cup. There is only one way forward - damage control, followed by Larsson's arrival on January 1. Barcelona have to put everything into the two Champions League games, even if that means dropping points in La Liga. The away clash against Levski Sofia isn't going to be a cake-walk, and Werder Bremen at Camp Nou on the final matchday will be even tougher. Not qualifying is not an option! Once they have secured qualification, they can throw everything into the League, and hope that the Intercontinental Cup doesn't take a lot out of them. They must use their reserve team shrewdly in that competition, rather than allow their marketable stars to burn out for the sake of some extra publicity. The only silver lining is that there are a few relatively easy League fixtures coming up, with the Real Madrid, Valencia, Deportivo, Zaragoza and Sevilla games all behind them, but they will only make the most of that if they set themselves up for it. As for new arrivals, Palacio or Luque are both good players, but if they take two months to settle in, the very purpose is defeated. The Argentine can wait for the summer. Larsson, and only Larsson, can solve their problems. But even before that, it is going to take something special, along with a lot of luck, for four players to fill three spots, and carry the team through to January without slip-ups. It could be Rijkaard's biggest test since the torrid four months at the start of his tenure three years ago! 2) Classic-sports - Vintage football & rugby memorabilia, 70's 80's 90's plus official lextra print. 3) Live scores of football matches - Fotbal live - Soccer live - Football live - Fotbal minut cu minut - Secunda cu secunda. 6) New England Sports Blog - New England Sports Blog is an interactive community and portal that provides the best in New England sports coverage including the Boston Bruins, Boston Celtics, New England Patriots and Boston Red Sox. Bojan Krkic, born on August 28, 1990, in Linyola (Serbian: Lleida)is a 16 year-old Serbian-Spanish footballer who plays for Barcelona FC in Spain. His father, who holds the same name was a well known footballer in Serbia, where he played for Crvena zvezda. Bojan Krkic Jr. shot to prominence at the UEFA European Under 17 Championships in Luxembourg in May 2006 when he was joint top-scorer. He achieved this despite only playing 45 minutes in the four out of five of Spain Under-17s matches. He scored a hat-trick against Luxembourg before inspiring his side to a 3-0 victory over the eventual champions Russia, with all of the goal being scored when he came on to the pitch as a second half sub. In the third match of the tournament, he scored a penalty after once again being introduced at half time. He started the semi-final against the Czech Republic but after his team mate Roberto Garcia was sent off, Spain struggled and lost 2-0 in a shock result. In the third-place play-off Krkic was once again a second half sub and wreaked havoc in Germany's defence as he scored the opener on 53 minutes. When the match went to spot-kicks, Krkic cooly slotted his into the top-right corner of the net and his side won the match 5-4 on penalties to finish third. Krkic is also reported to have scored over 800 goals in the lower divisions of Barcelona. He is expected to become a full Barcelona player very shortly. Once 17 (and able to sign professionally) it will not be long before he is in the first team. Giovanni dos Santos Ramírez (born May 11, 1989 in Monterrey, Nuevo León, Mexico) is a Mexican football midfielder who plays for FC Barcelona B and was part of the under-17 Mexican football team that won the FIFA U-17 World Championship 2005 held in Peru. He assisted in the first goal in the final game which the Mexican team won 3-0. With the number 8 on the back, Dos Santos, also known as "Gio", helped Mexico to defeat Brazil. A great playmaker, he is often compared to Ronaldinho both for his physical appearance and his skills with the ball. He is the son of the former Brazilian football player Gerardo Dos Santos, but better known as "Zizinho", who played on the Mexican soccer teams América and Monterrey in the early 1990s. Has two brothers; an older brother, Eder and a younger brother, Jonathan who also plays for FC Barcelona, but in the Juvenil B category.Together with his brother Jonathan dos Santos he is one of the most promising FC Barcelona players and also one of several highly-rated Mexican youngsters already playing in Europe. Gio Dos Santos scored in his debut game for FC Barcelona senior team against Aarhus in a friendly match on July 29th 2006. Still, his debut on an official match is pending, but it's expected that it would happen at some point during the year 2007; on that same year it's expected his participation with the Mexican U-20 National Team. Jeffren was born in Venezuela, emigrated to Tenerife, Canary Islands when he was only 2 years old. Now he is living at Barca´s youth academy in La Masia, Barcelona. Jeffren Surarez is a talented young winger, who dreams of following in the footsteps of his idol, Leo Messi, who is just half a year older than Jeffren but already a super star on the world stage. There are a lot of similarities between Leo Messi and Jeffren Suárez. Both, players are very versatile, extremely fast and have a great technique. Jeffren Suárez played this year in the Youth A team and gained his first senior football experience in playing for Barca C. For the next season, the pacey winger Jeffren has been promoted to Quique Costas' Barca B Team. Jeffren´s outstanding qualities are his speed and technique. He makes powerful runs on the wings, using both feet and has a very strong and precise shot. Since joining Barca´s youth side from Tenerife, talented Jeffren has changed his style from being a goalgetter to providing and feeding others with chances to score. In Tenerife he scored about 20 goals each season while at Barca he scored 5 goals in 2 years.He changed from an individualist to a real team player, his game is more complete and can play in several different positions. Javier Saviola has been ruled out for between four and six weeks after straining his thigh. The injury, together with Leo Messi's, leaves Barça with attacking problems. After losing Eto'o and then Messi, Barcelona coach Frank Rijkaard must now contend with the absence of another forward in Saviola. The Argentinian striker has suffered "a small tear in his left thigh muscle," said a club medical bulletin. "The injury is in a risky area and it will take four to six weeks to recover from." The former River goalscorer netted Barça's third of the night against Zaragoza, but incurred the injury in virtually the last action of the match. In the absence of Saviola, Rijkaard now has four forwards, Ronaldinho, Ludovic Giuly, Santi Ezquerro and Eidur Gudjohnsen, to choose from for the last few weeks of 2006. The club's medical team have also said that Messi, who will be out for around threemonths, will undergo surgery on Tuesday to repair his broken metatarsal bone in his left foot. Antoni Dalmau will be the doctor performing the surgery, which will take place at 9am in the Hospital Asepeyo in Sant Cugat. Doctor Dalmau and Doctor Ricard Pruna, will then hold a press conference at 1pm in the Camp Nou. FC Barcelona beat Zaragoza 3-1 tonight at the Nou Camp and are back at the top of the Spanish League table, as prior leaders Sevilla dropped two points after drawing at Racing Santander. In a close and entertaining match, Gabriel Milito opened the score for Zaragoza and Ronaldinho (2) and Saviola made the goals that sealed Barcelona's comeback. However, there was also bad news tonight as Lionel Messi got injured and had to leave the pitch in the 23rd minute, being substituted by Ludovic Giuly. Medical tests performed on the Argentinian player after the match have confirmed that Messi suffered a fracture of the fifth metatarsal bone of his left foot, will need to undergo surgery and may be out for three months. Barcelona are now the alone Liga leaders with 23 points. Sevilla, Real Madrid and Zaragoza come behind them. 1) All About F C Barcelona does not own any of the media related stuff (images and video clips) displayed on this site. These items have been collected freely from the world wide web and is believed to be in public domain. If you believe you own the copyright to the same displayed here, please feel free to inform me. I will take necessary actions on that. All the credits for these items belong to the original cappers, photographers or person related to making the same. 2) The site is hosted under Blogspot, therefore its security and privacy terms are the same mentioned by Blogspot. 3) The opinions expressed in the site are my personal opinion. If someone is hurt because of the same, I regret the same. 4) All About F C Barcelona may from time to time collect names and/or details of website visitors. This may not only include mail address, domain details but other details also. These details will not be passed onto any other third party or other organisation unless it is required to by government or other law enforcement authority. 5) All About F C Barcelona links to independently run web sites outside of its domain. This site takes no responsibity for the privacy practices or content of such web sites. 6) All About F C Barcelona accepts no responsibility for the content displayed in the discussion section of the site (like comments etc.). 8) The website use third-party advertising companies to serve ads when you visit our website. These companies may use information (not including your name, address, email address, or telephone number) about your visits to this and other websites in order to provide advertisements about goods and services of interest to you. If you would like more information about this practice and to know your choices about not having this information used by these companies, click here. On 22 October 1899 Joan Gamper placed an advert in Los Deportes declaring his wish to form a football club. A positive response resulted in a meeting at the Gimnasio Sole on November 29. Eleven players attended: Gualteri Wild, Lluís d'Ossó, Bartomeu Terradas, Otto Kunzle, Otto Maier, Enric Ducal, Pere Cabot, Carles Pujol, Josep Llobet, John Parsons, and William Parsons. As a result Foot-Ball Club Barcelona was born. Several other Spanish football clubs, most notably Real Madrid and Athletic Bilbao, also had British founders, and as a result they initially adopted English-style names. FC Barcelona quickly emerged as one of the leading clubs in Spain and they participated in the first Campionat de Catalunya and the first Copa del Rey. They won their first trophy when they won the Copa Macaya in 1901. In 1902 the club also played in the first Copa del Rey final, losing 2-1 to Club Vizcaya. In 1908 Joan Gamper became club president for the first time. Gamper took over the presidency as the club was on the verge of folding. The club had not won anything since the Campionat de Catalunya of 1905 and its finances suffered as a result. Gamper was subsequently club president on five separate occasions between 1908 and 1925 and spent 25 years at the helm. One of his main achievements was to help Barça acquire its own stadium. On March 14 1909, it moved into the Carrer Industria, a stadium with a capacity of 6,000. Gamper also launched a campaign to recruit more club members and by 1922 the club had over 10,000. This led to the club moving again, this time to Les Corts. This stadium had an initial capacity of 20,000, later expanded to an impressive 60,000. Gamper also recruited Paulino Alcántara, the club's all time top-scorer with 356 goals and in 1917 appointed Jack Greenwell as manager. This saw the club's fortunes begin to improve on the field. During the Gamper era FC Barcelona won eleven Campionat de Catalunya, six Copa del Rey and four Coupe de Pyrenées and enjoyed its first golden age. As well as Alcántara the Barça team under Greenwall also included Sagibarbá, Ricardo Zamora, Josep Samitier, Félix Sesúmaga and Franz Platko. There is often a fierce rivalry between the two strongest teams in a national league and this is particularly the case in La Liga, between FC Barcelona and Real Madrid. From the start the clubs were seen as representatives of the two rival regions of Spain, Catalonia and Castile, as well as of the two cities themselves. However the rivalry reached a new level during the Franco years when Real Madrid was widely considered to be the "regime team" while FC Barcelona was often regarded as the team of the opposition. Although following the Spanish Civil War Real Madrid received considerable institutional assistance from the Franco regime, as he saw the club as the sporting embodiment of the Spain he wanted to create, during the war itself members of both clubs suffered at the hands of Franco supporters. FC Barcelona president Josep Sunyol was murdered while Real Madrid president Rafael Sánchez Guerra, a prominent Republican, was imprisoned and tortured. They also arrested and murdered a Real vice-president and club treasurer and an acting president disappeared. In 1940 Enric Pineyro, a Franco collaborator, was appointed club president. The rivalry with Real intensified further after the 1943 Copa del Generalísimo semi-final between the two clubs. The first leg at Les Corts ended in a 3-0 victory to Barça, but the return leg saw them defeated 11-1. It has been alleged by some that the FC Barcelona players were pressured into losing the game and even Pineyro resigned in protest. The rivalry with Real was exacerbated significantly in the 1950s by the dispute over Alfredo Di Stéfano. The 1973/74 season saw the arrival of a new Barça legend – Johan Cruyff. Already an established player with Ajax, Cruyff quickly won over the Barça fans when he told the European press he chose Barça over Real Madrid because he could not play for a club associated with Franco. He further endeared himself when he chose a Catalan name, Jordi, for his son. He helped the club win La Liga for the first time since 1960, along the way defeating Real Madrid 5-0 at the Bernabéu. He was also crowned European Footballer of the Year twice in a row while at club. Cruyff returned to the club as manager in 1988, assembling the so-called Dream Team, named after the US basketball team that played at the 1992 Olympic Games hosted by Barcelona. He introduced players like Josep Guardiola, José Mari Bakero, Txiki Beguiristain, Goikoetxea, Ronald Koeman, Michael Laudrup, Romário and Hristo Stoichkov. This team won La Liga four times between 1991 and 1994 and beat Sampdoria in both the 1989 European Cup Winners' Cup final and the 1992 European Cup final at Wembley. They also won a Copa del Rey in 1990, the European Super Cup in 1992 and three Supercopa de España. With 11 trophies, Cruyff has been the club's most successful manager to date. He is also the club's longest serving manager. However, in his final two seasons, he failed to win any trophies and fell out with Josep Lluís Nuñez. This resulted in his departure. Josep Lluís Nuñez was elected president of FC Barcelona in 1978. His main objectives were to establish Barça as a world-class sports club and to give the club financial stability. In 1979 and 1982 the club won two of four European Cup Winners' Cups won in the Nuñez era. In 1982 Diego Maradona was signed for a world record fee from Boca Juniors. However his time with Barça was short-lived and unsuccessful and he soon left for Napoli. In 1985 under Terry Venables Barça won La Liga and in 1986 he took the team to their second European Cup final, only to lose on penalties to Steaua Bucharest. In 1988 Nuñez appointed Johan Cruyff as manager. 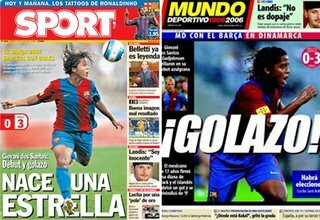 Despite the latter's success with the Dream Team (see section above), personal differences saw Nuñez sacking him in 1996. He was temporarily replaced by Bobby Robson who took charge of the club for a single season in 1996/97. He recruited Ronaldo from his previous club, PSV Eindhoven and delivered a cup treble winning the Copa del Rey, European Cup Winners Cup and the Supercopa de España. Among Robson’s non-playing staff was José Mourinho, who assisted with training and acted as translator. Despite his success, Robson was only ever seen as a short-term solution while the club waited for Louis van Gaal to become available. Like Maradona, Ronaldo only stayed a short time and he left for Internazionale. However, new heroes such as Luís Figo, Luis Enrique and Rivaldo emerged and the team won a Copa del Rey/La Liga double in 1998. In 1999 they retained the La Liga title and Rivaldo became the fourth Barça player to be awarded European Footballer of the Year. Despite this domestic success, the failure to emulate Real Madrid in the UEFA Champions League led to Van Gaal and Nuñez resigning in 2000. The departures of Nuñez and Van Gaal were nothing compared to that of Luís Figo. As well as club captain, Figo had become a cult hero and was considered by Catalans to be one of their own. It is widely believed that his dislike of the new president, Joan Gaspart, triggered his departure for arch-rivals Real Madrid. The Barça fans were distraught by Figo’s decision to join Real and during subsequent visits to the Camp Nou Figo was given an extremely hostile reception, including one occasion when a pig's head was thrown at him from the crowd. The next three years saw the club in decline and managers came and went, including a short second spell by Louis van Gaal. Gaspart did not inspire confidence off the field either and in 2003 he and Van Gaal resigned. After the disappointment of the Gaspart era, a combination of a new president, Joan Laporta and a new manager, Frank Rijkaard saw the club bounce back. After a shaky first half of the 2003/2004 season that left them lying mid-table in the league, a stunning run of form after the winter break pulled them up the table, eventually finishing second behind Valencia, and above arch-rivals Real Madrid. On the field an influx of talented players (Ronaldinho, Deco, Ludovic Giuly and Samuel Eto'o) and experienced professionals (Henrik Larsson, Rafael Márquez and Giovanni van Bronckhorst) combined with a nucleus of home grown players (Carles Puyol, Andrés Iniesta, Xavi and Víctor Valdés) saw the club win La Liga and the Supercopa de España in 2005. 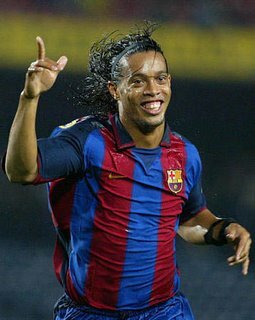 Ronaldinho was also added to the list of Barça players voted European Footballer of the Year. The only disappointment was the defeat against Chelsea in the Round of 16 of the UEFA Champions League. A significant rivalry between the two clubs has existed since. For 2005/2006 the team was strengthened with arrival of Mark van Bommel and the emergence of Lionel Messi. They subsequently retained the La Liga title and won the UEFA Champions League and the Spanish Supercup. For the 2006/2007 season Barcelona bought Eiður Guðjohnsen from Chelsea to fill the gap left by the departing Henrik Larsson, and the defenders Gianluca Zambrotta and Lilian Thuram from Juventus after the latter's relegation to the Italian Serie B due to the 2006 Serie A scandal. Javier Saviola also returned to the squad after failing to sign for another team. The team has since won the Spanish Supercup against Espanyol, but lost the European Supercup to Sevilla F.C.. In September 2006, following a judicial ruling that he had remained in office after his term had expired, Laporta was automatically re-elected as the new president of the club, as he was the only candidate who managed to obtain the required number of signatures backing his candidacy. On 7 September 2006, an agreement between FC Barcelona and UNICEF was reached whereby the club would donate 0.7% of its total yearly revenue to the organization for five years. As part of the agreement, FC Barcelona will wear the UNICEF logo on the front of their shirts, which will be the first time in club history that the logo of another organization (save for the logos of the athletic manufacturers of the shirts) will be present. Futbol Club Barcelona, also known as FC Barcelona, or Barça, is a sports club based in Barcelona, Catalonia, Spain. It was founded in 1899 by a group of Swiss, English and Catalan footballers led by Joan Gamper. The club has become a Catalan institution, hence the motto Més que un club (More than a club) . The fans of FC Barcelona are known as culers (or culés). In September 2006, the number of socis (club members/owners) reached 151,127, while the number of penyes (officially-registered supporter clubs) reached 1782 worldwide as of June 2006. The club's main stadium is the Camp Nou. Barça is best known for its La Liga football team, and the reserve football team, FC Barcelona B. The senior team was among the founding members of La Liga in 1928, and, together with Real Madrid and Athletic Bilbao, they have never been relegated from the Primera División. The club were also the first La Liga champions and are currently champions of both Spain and Europe. The club includes three other professional sports teams, that compete at basketball (Winterthur FCB), handball (FC Barcelona-Cifec) and rink hockey (FC Barcelona Sorli Discau). There are also a number of prominent amateur sports teams that compete at futsal, rugby union, women's basketball, women's football and wheelchair basketball. These include FCB Rugby, UB-Barça and FC Barcelona-Institut Guttman. Other amateur teams represent the club at ice hockey, athletics, baseball, cycling, field hockey, figure skating, and volleyball. Barça have to date refused to allow commercial sponsorship logos on their football shirts. However, since 2005 they have worn the TV3 logo of Televisió de Catalunya on the left arm. On 14 July 2006 the club announced a five year agreement with UNICEF which includes having the UNICEF logo on their shirts. The agreement will see Barcelona donating US$1.9 million per year to UNICEF. These new look shirts were first worn in the Champions League game against Levski Sofia on Tuesday 12th September 2006.